The ICL 2966 computer at The National Museum of Computing, Bletchley Park, UK. Photo by John Robertson for TNMoC. A couple of days ago I received the below news. The news that Fujitsu, the IT giant, is helping to keep the spirit of computing alive in the UK. They have become a foundation Sponsor of The National Museum of Computing. Fujitsu, the global ICT provider, is supporting The National Museum of Computing (TNMOC) on Bletchley Park by becoming a Foundation Sponsor. The move reflects the pioneering role that Fujitsu’s predecessor companies in the UK, such as ICL, played in the early days of the UK computer industry. 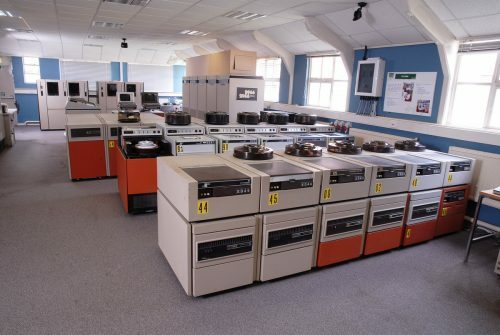 Today that history is reflected at TNMOC in the form of the Museum’s largest computer, the ICL 2966 of the 1970s and 1980s, and its forerunners the Elliott systems of the 1960s. These systems have or are been restored and can be seen in operation at the Museum. Tim Reynolds, Chair of TNMOC, said: “Fujitsu’s generous sponsorship of the Museum is inspiring. Fujitsu’s role in conserving British computing heritage has been exemplary. Its archives have contributed significantly to our displays of early British computing that today attract great interest not just from those who have lived through the developments, but also from upcoming generations of aspiring computer scientists and engineers on the Museum’s Learning Programme.